The small asteroid hit the atmosphere moving at a blistering 40,000 miles per hour. That’s more than twice as fast as asteroid 2012 DA12 is moving. The space rock lasted about 30 seconds in the atmosphere before breaking apart 12 to 15 miles above Earth’s surface. “The event must have been brighter than the sun if you were there to watch it,” said Paul Chodas, research scientist in NASA’s Near Earth Object Program Office. 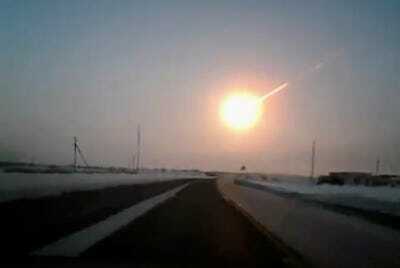 Scientists also verified that the Russia meteor is not related to asteroid 2012 DA14 in any way. They know this because asteroid 2012 DA14 is about three times bigger, at 150 feet in diameter, and it was travelling in a different direction, from south to north. The bigger threat to Earth is large asteroids, like the one that ultimately wiped out the dinosaurs. NASA, the lead agency in worldwide asteroid tracking, says it has found about 95 per cent of large near-Earth asteroids, asteroids that are close enough and big enough to pose a hazard to Earth, though not necessarily headed in our planet’s direction.